Yesterday, I attended a very informative and fascinating paper at the Institute for Historical Research that examined feudalism, land distribution and documents pertaining to late medieval English land ownership. The documents used in this research were known as Inquisitions Post Mortem; they are medieval English records of death that noted the lands held at the deaths of tenants of the crown. The earliest Inquisition was in 1236 during the reign of King Henry III and the final Inquisition was made in 1640 at the beginning of the English Civil War and was formally abolished in 1660 thereby ending the feudal system. This project, funded by the Arts and Humanities Research Council, aims to digitise and make accessible the IPMs from 1399 – 1447. What was feudalism? In simplified terms, it was the relationships between Lords and their vassals for services and labour in exchange for protection and land. Holford provided a basic diagram demonstrating these relationships.The King, with a direct line to Knights, and a direct line also from the King to Barons and Bishops, followed by servants and peasants. 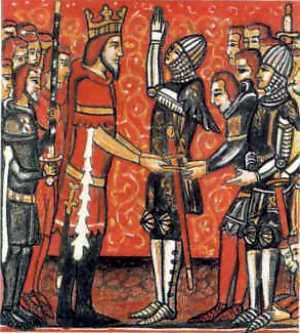 The IPMs were documents created by the crown to enforce the crowns rights within the feudal system. The Inquisitions were created by an official called the Escheator who protected the crowns rights and ensured that the property was not left in limbo, but returned to the state under recognised ownership. The Inquisitions were sworn inquiries into the land by the tenants in chief. From the thirteenth century onward, these documents told us the nature of the land owner’s legal interest, the type of lands held, who the lands were held by and what were the feudal services rendered. Inquisitions also they tell us when the tenant died and how much the land was worth. The property worth could be a single evaluation or a detailed itemisation, the documents often named the jurors present and any grants that were made to the land owner. Holford showed an example of this with the fifteenth century Inquisition of Thomas Bataille of Essex. There is some difficulty in that not all documents have been published. The publication of these Inquisition calendars began in 1898 covering the later period of 1485-1509. To date, 1447-1485 and 1509 onward have yet to be published. The older Inquisition documents from 1236-1399 did not list extents and valuations, juror names, modernised dates and places. Between 1399-1422, the jurors names were still left out but extents and modernized dates were included. Historical Value: Why are these documents good value for digitisations? Inquisition documents contain landscape history, references to schools, and a wide range of material. Digitizations make the variety of this material more accessible. These documents are useful for telling us about landed society, the aristocracy and gentry, estates, wealth, marriages and marriage settlements, and attitudes towards inheritance. Inquisitions also tell us about the descent of manors and property and changes in social mobility. They give us valuable insight into economic and agrarian history, the size and composition of estates, regional variation, landscape history, and settlement history. They are great sources for demographers because Inquisition documents indicate life expectancy, time of year of death (showing seasonal spikes in deaths), and fertility rates. Lastly, these records can tell us about government through the enforcement of royal rights, manipulation of the system by tenants, the role of the jurors, and the interactions between central and local systems of administration. However, there have been intense debates about the reliability of Inquisition documents. The negative opinions come from scholars who have studied detailed family records (versus Inquisitions), which appear to be of higher quality because they are often much more detailed. However, it is impossible to take a black and white approach to this topic, Holford pointed out that, ”Mapping and statistical analysis at a large enough scale may also be able to compensate for some of these limitations and idiosyncrasies”. Mapping the Medieval Countryside project grew out of the most recent publication released between 2003-2010. The original objective was to complete the calendar between 1447 onwards. They examined their audiences and found that it wasn’t just academics, but many local historians, family historians, and geneologists wanted these documents. Leaving them solely in print was unsatisfactory because it was very expensive and limited audience accessibility. This project was daunting and laborious at times due to the vast amounts of information that were indexed in a complicated fashion. Currently, Volumes 1-2 are available on the Mapping the Medieval Countryside website and British History Online but they have limited functionality because of the variant ways names were spelled. Holford then discussed the significant contributions to this area of study by Professor Bruce Campbell, who specialises in the Late Medieval economic history of Britain and Ireland. Campbell has done important work on Inquisition documents and wrote, England on the Eve of the Black Death . He used Inquisition documentation for his book. It provided a new look at the value of seigniorial resources. Campbell was able to map in greater detail features like watermills, and the distribution of landscape. He was also able to map the value of different items. By 1399, the material was not as rich following the decline of demesne farming. In spite of this decline, there is a substantial volume of material. Contrary to commonly held beliefs, Primogeniture holding was still the most common land holding at this time. There are approximately 7000 documents, 15,000 holdings, and 2,500 manorial extents dating between 1399-1447. The project captures agrarian information, not just manorial extents, as well as highlighting grants, enfeoffments, tenures and services. Please help support this fantastic project.